My husband frequently comments on how I can cook dinner and maintain conversations with all of the members of my household and advance the laundry and answer the phone all at the same time. Distracted cooking is not really challenging for me. It kinds of fits with our family lifestyle. Now distracted baking may be another thing all together. I am writing my final paper for what has been a challenging, annoying grad school course. The problem with online classes is that you are limited in your interaction with your professor and that he/she can post a comment onto your work that doubles or triple the amount of work that you have to do without any effort on their part. Maybe it is distracted teaching. Maybe there is a purpose to it. I am waiting for this class to be over, but I am thinking about my paper and working on my paper while making Hamelman's sourdoughs with whole wheat and with increased whole grain. Distracting baking, perhaps not a good idea. I made the levains last night. It is hot, humid and heavy here in Texas. Nothing is going to take more than 12 hours to be ready. I assembled my mis en place for the whole wheat. Mixed the flours, levain, and water. Waited for the autolyse phase to end, added the salt, mixed for 2 minutes and put it aside for fermentation. The I assembled my mis en place for the increased whole grain. Can you spot a significant difference between the two mis en places. I mixed the flours, levain, and water and made liquid slop. Ah, distracted baking. Did I check the errata sheet before I started baking? No. Did I check out the Mellow Baker's web site, too easy. Look at the differences in bread flours between the two loaves. My increased whole grain mis en place had 8 oz which, we all know is not 5.5 cups. Not the 1 pound, 8 oz that the recipe actually needs. It didn't take me long to notice the mistake. When I combined the ingredients, I made dough batter. No pictures because I was working so quickly to correct the error so the rye didn't turn into gluten mess. I added extra flour to what I hope is the correct proportions. Perhaps now would be a good time for all of us to go through the errata sheet and make the necessary corrections. Or we could all work on our papers. The dough fermented for two hours and then was shaped. The whole wheat loaf was easy to work with. I am concerned about the increased whole grain. It has huge air bubbles, and is a little looser than I would prefer. I ended up with some beautiful looking loaves. The ones on the left are the increased grain. The rye is slightly darker. The both have a nice flavor. This salad appeals to me, I hope that I enjoy it. I may end up eating all of it. Any one who has been following my bread baking blog is aware that my family is adverse to fruit in the breads. Cooked raisins are not allowed in my house. Delicious dates never factor into my ingredients. I was pondering their aversion to fruits. They will eat apple pie, blueberry pie, tarts with fruits but ask the fruit to share the stage, combine with dough and they turn their noses up at my baked goods. Their dislike extends to some natural dinner combinations including my favorite pork with apples. There an exception to the rule, mangos and pork have the approval of all family members. I made up the salads and put them in the refrigerator to chill. Now, I just want to let you know that I don't make these things up. "This is that Bittman guy, isn't it"
"on my fork there are onions, cheese and you would think tomatoes, but no..."
Last summer Mark Bittman published 101 salad recipes in his column in the New York Times. He says that the majority of them take less than 20 mins to prepare. I need to do something to offset my fascination with baking all the recipes in a bread cookbooks! The Mellow Bakers are baking their way through the 84 recipes in Jeffrey Hamelman's book, Bread. The Modern Bakers are baking their way through Nick Malgieri's The Modern Bakers. Bittman's recipes are indeed minimalist. A list of ingredients, no measurements. They plant the idea for a delicious salad. I've made quite a few of them, but this summer I am going to focus on seeing how many I can try. Tonight's salad. Chickpeas, shredded carrots, celery and coconut with a dressing of lemon, olive oil, cilantro and curry powder. I really enjoy cilantro, however I can remember the first time I tried it. We were out on a fancy date night. With two boys, fifteen months apart, we didn't do that much. We had been transferred to Tucson, AZ. Our first experience with Southwestern cuisine. Tom ordered some soup and had me taste it. We were both pretty certain that the chef had dumped soap in to the soup. Cilantro aldehydes are similar to aldehydes found in soaps and lotions. Some people can't stand the flavor. The New York Times has an interesting article on why people don't like it. Our tastes have matured, we really enjoy cilantro. We try to grow it in the backyard, before the heat gets to it. 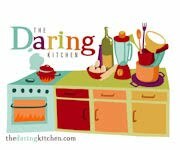 Valerie, from the Chocolate Bunny and Evelyne from Cheap Ethnic Eatz, are hosting June's Daring Cooks Challenge. They did indeed present a challenge. There were three pate recipes to choose from and then, of course, one must make bread to accompany the pate. I chose to make the tricolor vegetable pate from their recipes. And then I thought about some of the pates that I had read about in the Frog Commissary Cookbook. This was one of the earliest, off the beaten path, cookbooks that I owned. I lived in Philadelphia when Steve Poses had several restaurants going and would stop by the Commissary and look at their delicious takeout. This cookbook has perhaps one of the best carrot cake recipes. I had always passed by the pates, not really something we eat a lot of. But they were calling to me. The bread choice was easy. The Pain a l'Ancienne was one of my favorite breads from Peter Reinhart's, The Bread Baker's Apprentice. It is a very wet dough, 79% hydration and relies on cold fermentation. That is part of its allure, you make it one day, put it in the refrigerator and wake up to dough that is almost ready to be made into delicious baguettes. The tricolor pate was easy to make. It has a white bean layer, a roasted red pepper layer and a basil, parsley pesto layer. It chilled in the refrigerator, unmolded easily and looked tempting surrounded by sliced bread. The Frog Commissary cookbook had an interesting pate recipe for a country pate. It included ground veal, ground pork, chicken livers, chicken breast and ham that had been soaked in brandy, pistachios, spices, eggs, cream and garlic. An amazing amount of ingredients that were formed into loaf pans lined with pork fat and cooked in a water bath. They also had a seafood pate that combined salmon and scallops, two of my favorite things. The delicate pink layer was filled with a line of dill, spinach, scallops. I put everything out on the table, added some sausage and cheese. We all sat down to a delicious, unusual afternoon feast and promptly went off for an afternoon nap! One of the breads for June in the Mellow Bakers Challenge is Beer Bread with Roasted Barley. Hamelman says that husked malted barley is easy to find in beer-brewing stores. My beer-brewing stores referred to it as dehusked barley. Apparently, there are many varieties of barley. My local store had a dehusked, already roasted dried barley called carafa II malt. There is another store on the other side of town that has more varieties of barley, I may have to visit it. The roasted barley is very dark. I tasted it and it was not bitter. The bread starts off with a polish made with equal parts of bread flour and water and only 1/8 of a teaspoon of yeast. I am always impressed at what such a small amount of yeast can do. The final dough includes the poolish, bread flour, whole-wheat flour, beer, water, salt, yeast, malted barley. This is a bread full of choices. What kind of barley, what kind of beer. I decided to try a lager for the beer. All of the ingredients were weighed out. Again, Mr. Hamelman please use metrics. Those .6 oz are a little challenging and the fractions make me feel old, my eyes are failing. The ingredients were put in a mixing bowl. I blended the flours, salt, yeast and barley and then added the poolish, beer water mix and turned it on and slopped beer all over my pajamas. Note to self, mix with spoon in the future. The bread was mixed for six minutes and then left to ferment for two hours with a fold after one hour. I needed to add a little more flour and questioned if I should have added more. At this point, I am a little worried about the dough. It is still pretty wet. The question is is it modernly loose hydration? I shape it and divide into two. At some point, I will buy another bannetone. I shaped one into a boule and one went into the bannetone and they were left to rise for an hour. After about 70 mins, the boules were baked. The loaves only took 30 mins until they were done. They had a delightful crust and a complex flavor. I have never baked with barley or beer. I can't wait to see what my fellow mellow bakers think of this, I think that there will be a lot of variables, what kind of barley, what kind of beer. I wonder what the verdict will be. The June breads have been listed in the Mellow Baker's challenge. They include Vermont Sourdough, Pizza Dough and Beer Bread with roasted barley. We are out of bread, so I decided to make the Vermont Sourdough. I took my starter out of the refrigerator and refreshed it a couple of times for two days. One of my sons has returned for the summer. He has been out of the house for several years rowing at college or working or some bizarre combination of the two. I overheard my husband explaining to Matt that he shouldn't throw out any slimey things that he finds on the counter, "they probably belong to Mom and are going in bread." Matt seemed agreeable to the idea, especially since bread was the endpoint. I made the liquid-levain build 16 hours before I thought that I would use it. Bread flour, water and starter were combined, covered and happily bubbled away. I had to go to work on Saturday for a work day. Friday was the last day for school for the students but the staff had to come in half day work day on Saturday. The day was to end with a 45 minute presentation by the superintendent. 90 minutes later, I was worrying about my levain. No worries, I finally got home, it still looked happy. I added the bread flour, rye flour, and water. Mixed it together. Let it stand for an autolyse phase for 30 mins. Then added the salt, mixed and fermented for 2.5 hours with a fold at 90 mins. I shaped the bread into two boules and stuck it in the refrigerator and started the summer by heading off to Shakespeare in the Park. This morning, I baked the delicious bread and everyone in the house will be happy when they come down the stairs. I will try the other variations of this delicious bread.